I've been asked to write again on the peculiar situation regarding 1st class booklets of 12 stamps that have been produced in recent years. Most of the questions are answered in the Comments on the earlier post, but this ought to explain things more clearly. 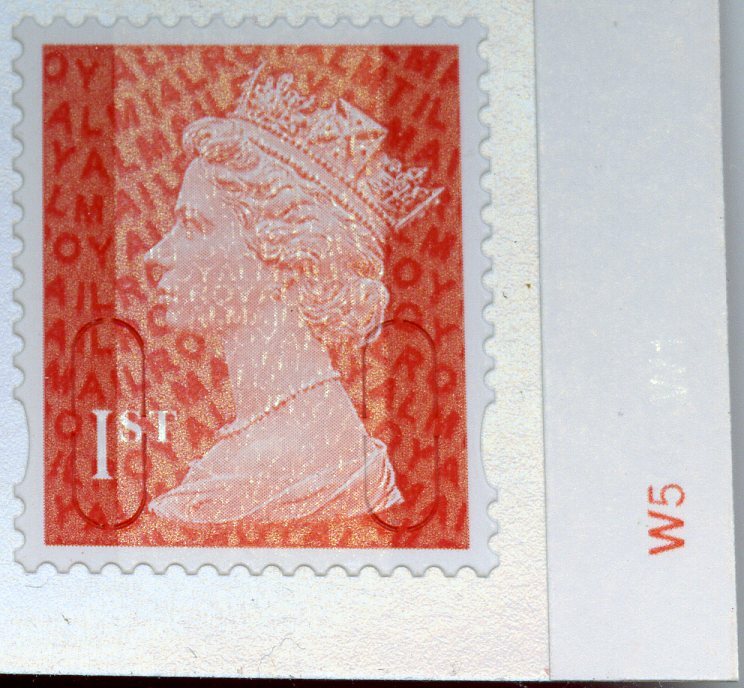 The red 1st class stamps were first issued in January 2013 with a M12L year code, using cylinder W5 which had previously been used for gold stamps before the Diamond Jubilee issue in 2012. Red cylinder W5 continued in use through 2013 to 2014, the long life of the cylinder being ascribed to relatively lower volumes and the better quality of modern cylinders. spring of 2015. Searching for the M15L version even after Easter all I could find were M14L, and only a few M15L appeared on eBay by the end of June. Early in October 2015 the M15L printing was suddenly available all round the country, as reported here. Because of the relocation of Walsall's printing to a new factory and new press, these were printed from a new cylinder W7, with the number positioned closer to the stamps, and thus hidden by the front cover of the booklet. What wasn't expected was that the same red W7 cylinder would have been used in conjuction with W14L iridescent, or that these would not appear until after the M15L had been discovered. These booklets are distributed in wrapped packs of 50 with a barcode and packing date printed on, and it is quite possible that we have - naturally - passed by the packets with no cylinder booklets in. However, the M15L seen so far have a packing date of 30/03/2015 while the M14L W7 version have packing dates in April! So the 2014 version of 12 x 1st booklets exists in three forms: Cylinder W5 with two different telephone numbers on the covers, and Cylinder W7 not released until October 2015. At present we do not have any stock of M14L W7 booklets. Curioser and Curioser - for those who like a bit more detail. The 1st class booklet printings. The order of cylinder numbers changed on the new press. A new iridescent cylinder W1 for 15. Phosphor should have been changed to W3 for the new M14L printing. The 2nd class booklet printings. The iridescent number is new because it is a new year, and the phosphor has, correctly, been increased by one because it is a new version of the single-band phosphor cylinder. So the numbers on 1st class have been W5, W7 and 2nd class are W4, W6 - but historically cylinder numbers have been allocated in sequence for each design. There is no known reason why International Security Printers should not allocate numbers consecutively for each type of book - 1st x 12, 2nd x 12, 1st x 6, 2nd L x 4, 1st L x 4, as they have done for some of the phosphor cylinders, and should have done in all cases. How about this as an explanation, In preparation for the new number and their impending move Walsall printed a larger run than normal on the old equipment. In anticipation that no further printing would be required to replenish stocks before 2015, a new cylinder was produced with 2015. 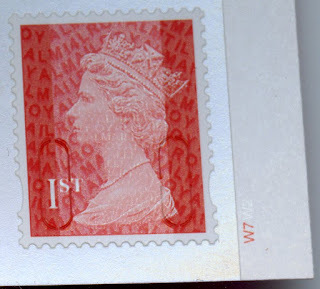 In the meantime, Royal Mail does a mass withdrawal of books with the old number so a new run is required with M14L, so a new iridescent cylinder is prepared out of sequence. We know that photogravure cylinders have a longer life than litho plates, we just have to remember the quality used by Walsall & Questa in their books compared to Harrisons, so them main image and phosphor cylinders could last over may print runs/years.